The men’s basketball team won their first game against Pepperdine since 2011 on Monday 90-83. Redshirt freshman Lamine Diane led the way with his fourth double-double of the season. The Matadors were unable to get much momentum in the first half, turning the ball over 10 times to gift the Waves 12 points, while also losing the battle on the defensive glass, allowing Pepperdine 14 second-chance points from seven offensive rebounds. The Waves came out of the gates shooting hot, using good ball movement to find the open man on the perimeter to take a 10-point lead midway through the first half before the Matadors went on a surge to take a 44-42 lead into the break. Freshman guard Darius Brown II led the way in the first half, gathering nine points on 3-5 shooting while also registering seven assists. The second half started out as a back-and-forth affair. The game was tied at 59 five minutes in to the half before the Matadors started to pull away. Freshman Michael Ou, who came off the bench after starting five of the first six games, sparked the team with effort plays on both ends of the court that got the entire CSUN bench out of their seats. 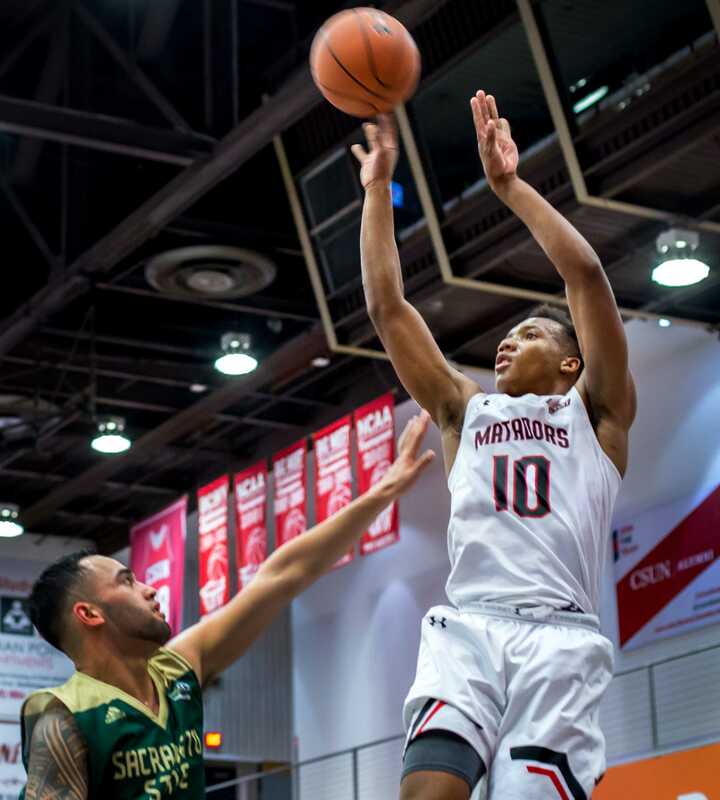 With renewed spirits, the Matadors began to build a lead quickly, with the backcourt duo of Brown and Gomez at the heart of it all. Brown would finish with 20 points and nine assists while Gomez nearly matched him, finishing with 19 points and seven assists. Diane was a huge beneficiary of the backcourt’s selflessness on offense, using his length to run the floor and get in position in the post en route to a 29-point, 12-rebound double-double. This game was also a reunion of sorts for members of both coaching staffs. CSUN assistant Jim Harrick returned to Pepperdine after leading the Waves to four NCAA Tournament appearances during his ten-year stretch as head coach from 1979-1988. Pepperdine head coach Lorenzo Romar was able to reunite with Harrick and Gottfried as three-fourths of the coaching staff that led the title-winning UCLA team in 1995. After the win, the Matadors hold a record of 2-5. They will next play Wednesday, Dec. 5 at 7 p.m. at home against Cal State San Marcos before they go on the road again to play San Diego on Sunday, Dec. 9 at 1 p.m.